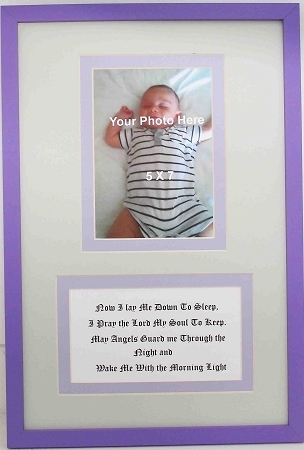 Wall Decor Christian Frame holds a 5 x 7 PORTRAIT photo includes a Christian night time prayer " Now I lay me down to sleep, I pray the Lord my soul to keep. May angels Guard me through the night and Wake me with the Morning Light". Medium Purple wood frame includes a light green and light purple double mats with a 1/2 inch revel of light purple. Wall decor includes a photo opening changeable from the back. Great for newborn gift or nursery decor.